The Treehouse at the RAC offers exceptional care for children ages 0-11 in a fun and nurturing environment that encourages them to grow and learn. It is our goal at the RAC Treehouse to keep your children’s bodies and minds active during their visit with the Treehouse Team. 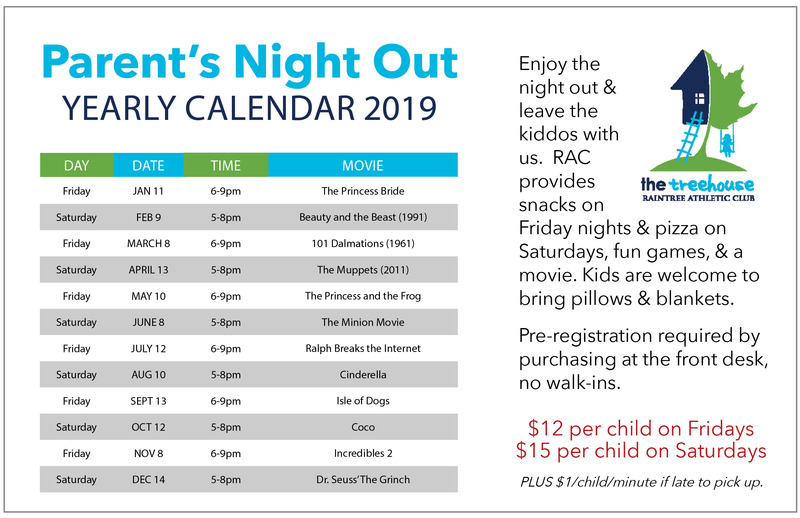 PARENTS NIGHT OUT – HAPPENING ONCE PER MONTH! Rules & Regulations: Registration opens 2 weeks prior to the current month’s Parent’s Nigh Out. Registration will CLOSE 24 hours before Parent’s Night Out. Reserve your spot by purchasing at the front desk. Sorry no walk-ins. $1/minute/child if late to pickup. Maximum of 25 children may attend. Cancellations: You must call 970-449-6816 at least 24 hours prior to PNO night to cancel. Any cancellation received later than 24 hours prior to PNO night will not be issued a refund. Got a case of the Mondays? Come to the Treehouse in your PJ’s and enjoy some extra special Monday activities! HAVE A BIRTHDAY PARTY AT THE TREEHOUSE! Our energetic and involved Treehouse Team will help make some priceless memories for your family and friends. We will help decorate for your party, provide music, facilitate games encouraging attendees to enjoy themselves and be active. Personalized music and decorations also available. Parties can be held in the Treehouse or Conference Room and may include Pool time or Basketball Court time! Each team member at The Treehouse loves working with children and/or has children of their own. Every team member at the RAC is CPR and First Aid certified. All ages are accepted. The Treehouse has designated areas for newborns, infants, toddlers, and school aged children. Children under the age of 1 year are allowed in the Treehouse for a maximum of 2 hours per day. Children ages 1 to 11 years, are allowed for a maximum of 2.5 hours/day. The RAC Treehouse uses electronic punch cards in order to make check-in easier. Visits may be purchased at the Front Desk for $2.75/visit/child or purchase Unlimited Childcare for $33/month (1st child) and $28/month (each additional child). To purchase and set up your unlimited childcare see the Business Office. Every time you bring your child to The Treehouse, we will ask for your name and one visit will be deducted from your account for each child. We do not need a reservation or prior notice in order for your child to use our facility, so feel free to drop off as long as you remain on the premises while your child is in our care. Parents and/or Guardian are required to fill out a waiver of liability for their children before the facility is used for the first time. Please note that a signed waiver must be on file for each child that is cared for in the Treehouse (childcare). Waivers must be signed by the child’s parent or legal guardian. When bringing another child (a friend or relative’s child) into the Treehouse, please ensure that parent or legal guardian has come into the facility to sign a waiver for them. Without a signed waiver, the RAC team will not allow the child to enter the Treehouse. This is a state regulated law that RAC must be abide by. If your child is in disposable diapers, please provide extras and we will be happy to change your child when necessary; please note that NO cloth diapers will be changed (into or out of cloth diapers). In order to prevent the spread of illness to other children or our team, we ask that you keep your child home if they have a cold, cough, fever, runny nose or any other cold or flu symptoms. Please be fever-free for at least 24 hours prior to attending the youth fitness center. The Treehouse does have snack times throughout the day and is happy to distribute any snack you provide for you child. We do not provide the snacks in childcare due to the increase in food allergies. We are a peanut free zone so please refrain from bringing peanut products and please inform the staff if your child has any other food allergies.